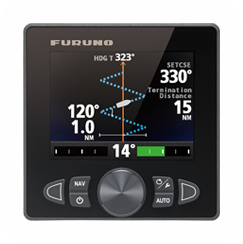 The optional SAFE HELM and POWER ASSIST features provide a unique interface to the vessel's hydraulic hand steering system, providing unrivaled comfort and control of steering directly from any manual helm on the vessel. These two modes greatly reduce steering effort and enhance the safety of your autopilot. The POWER ASSIST mode incorporates the SAFE HELM concept and provides speed-based, power assisted steering, which greatly reduces manual helm effort in maneuvering situations. POWER ASSIST is a unique helm-activated assisted steering feature that can augment or replace separate electric and power-robbing, engine-driven power steering systems on many vessels. POWER ASSIST reduces steering system complexity and costs while increasing economy. With the brand new SABIKI mode, your NAVpilot 711C has just become even more capable than before. SABIKI mode lets the autopilot control while you are drifting astern so you can focus on fishing instead of steering. Moving astern at a slow pace, the SABIKI mode is uniquely tailored for sabiki fishing, jigging and bottom fishing. Sabiki fishing requires a bit of technique, and no matter if you just started or have considerable experience, the SABIKI mode will help you catch the bait fish needed for the big catch. And the best thing, there is no need to install additional hardware or sensors. Just perform the automated software upgrade, and the SABIKI mode will be added to your NAVpilot 711C. SABIKI mode is only available on vessels with outboard engines.